Implement your SDLC methodology to perfection with our suite of project management tools. In order to maintain quality through every phase of the software development life cycle, you need to equip yourself with the best tools available. See how ProjectManager.com’s planning, tracking and reporting tools can help you reduce costly errors and improve production time. The software development life cycle (SDLC) is a process by which software is developed and deployed. It’s a process that encompasses every phase of software creation, from conception to maintenance after the software is released. There are a variety of SDLC methodologies, including waterfall, agile and others. Teams select a specific methodology with the goal of producing their software as quickly and as cheaply as possible without sacrificing quality. This is achieved by choosing the right SDLC methodology for the context of your software development project. Requirements Gathering: Understand the proposal put forth by the customer, and then gather their requirements for a suitable solution. Be sure to probe as much as possible to gather as much information as you can at this stage. This phase is heavily documented so that developers can revisit requirements at anytime. Analysis: During this phase you need to analyze the problem in the context of the organization’s policies and objectives. While you are analyzing the problem, consider whether or not you need to develop a new system, or simply improve an existing one. You’ll want to create a project proposal for your solution that includes the costs and benefits of your choice. Plan & Design: This is when you elaborate on a project proposal by developing a plan for meeting those requirements laid out by the customer. Once you have a plan, design concrete specifications for the developers to utilize, like screen layouts and other materials. Build: During this phase the actual code is constructed. Test: Now that the code has been written, it’s time to test. Usually this is done in a special environment, so the team can check for bugs and other mistakes without being distracted by too many variables. Deploy: After all known errors have been eliminated, the software is deployed. This is when the product is actually put into production and released in a business environment. Maintain: During the maintenance phase, the software is maintained so that it stays effective and relevant. Tweaks can be made to the initial software so that it remains a viable solution that is free of bugs. There are several different methodologies that can be used to execute the SDLC. Each has its own set of strengths and weaknesses. Below is a high-level explanation of a few different SDLC methodologies. The waterfall model is the most traditional SDLC methodology. This model focuses on gathering all of the customer requirements on the front-end of the project so that every step of the SDLC can be planned. Once planned, the steps must be executed in a linear fashion, where each phase must be completed before the next can begin. Its logical structure, and its ability to set near-accurate estimates for budgets, resources and deadlines, make it a popular methodology when the project is familiar and contains very few unknowns. Customers often don’t know exactly what they need at the beginning of the project. Formalized structure can reduce speed of execution. If an error is found during the testing phase, it can be very expensive to fix. The v-shaped model is very similar to the waterfall model, in that it also features a rigid, well-thought out plan (this time in a v shape). However, the biggest difference between v-shaped and waterfall is that the v-shaped model has a big emphasis on testing. Testing should be completed after each phase in order to reduce errors as the team progresses through the plan. An inability to hit deadlines due to extensive testing. A lack of adaptability due to a linear structure. The Agile model was made in response to the rigidity of the waterfall model. Agile is an iterative process where the team is constantly re-evaluating their priorities based on regular customer feedback and the success of their sprints. Sprints are short work periods, maybe 2 weeks, where the team tries to knock out high-priority tasks and release a workable product for customer feedback. The Agile model rejects the concept that you can know everything about a project at its onset. Too much customer feedback can send the project astray. A lack of a solid plan can make it difficult to estimate deadlines and resources. The big bang model rejects planning almost entirely. There is also very little emphasis on gathering requirements, and instead relies on the ability of the developers to find a good solution through trial and error. This model jumps straight into the development phase, and code is written without much analysis. The big bang model is better suited for short-term projects. Customer dissatisfaction due to a lack of requirements. An inability to establish hard deadlines. Not good for long-term projects due to the inherent high risk. Can end up being rather expensive due to a lack of planning. Which Software Development Process is Right for You? There is no right or wrong SDLC methodology, as it’s clear that each has its own strengths and weaknesses. It’s important to choose your methodology based on the context of the problem that you and your team are trying to solve. Regardless of the methodology that you choose, you’re going to need to use the best possible project management tools to bring your software development life cycle to a successful conclusion. 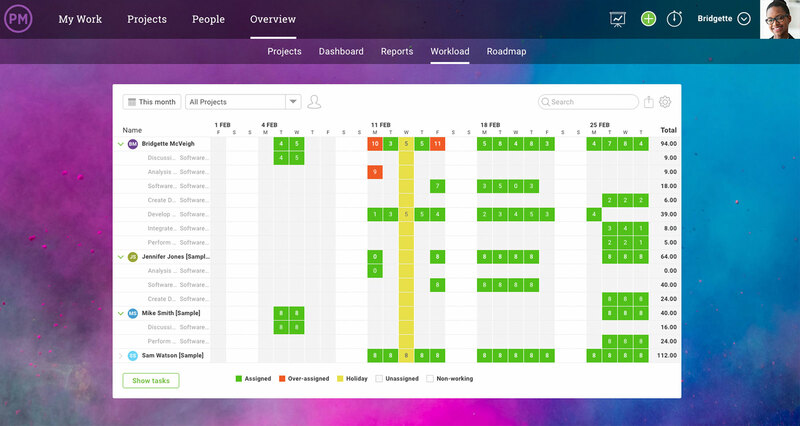 ProjectManager.com has the planning, tracking, collaboration and reporting tools you need to deliver a quality product to the customer every time. 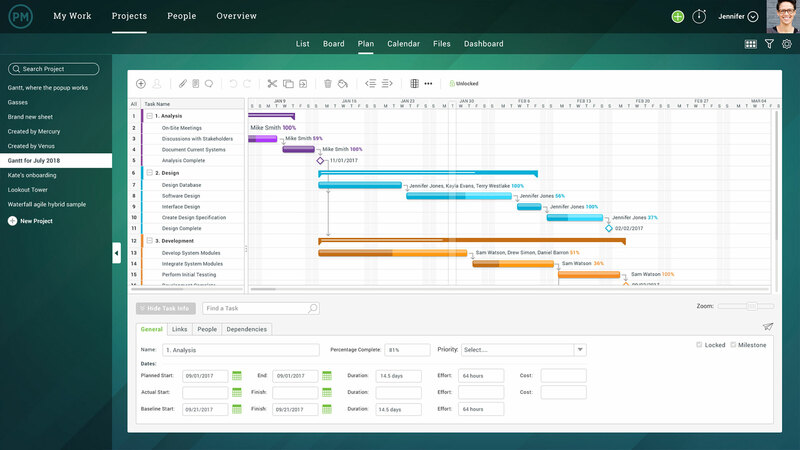 Our interactive online Gantt charts are perfect for planning your software projects, especially with waterfall and v-shaped models. Assign tasks to team members, drag and drop timelines and create dependencies so that phases are guaranteed to be completed in a sequential manner. You can even attach files to tasks in your project plan so that all project documentation stays with its corresponding phase. No matter your methodology, you need to track your progress. If you’re using the Gantt chart, it’s easy to set milestones to see your progress at a high level. For a detailed progress report, use our real-time dashboard which features a live look at task progress, expenses, workload, and more. Plus, we have 1-click reporting features that generate reports in seconds, which can then be shared online with your customers, managers and team members. 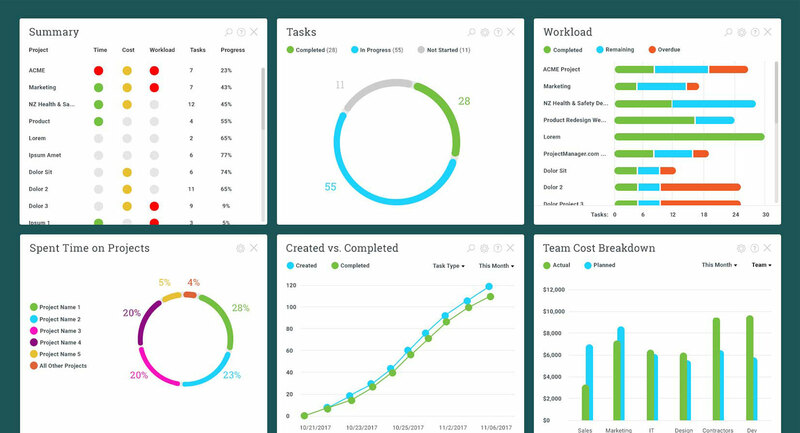 Use our workload management tools to track team workload across tasks in a software project. With a color-coded calendar, it’s easy to see on a daily basis which members of the team are being overburdened or underutilized. Keep your schedule extra organized by setting regular working hours and holidays to limit the amount of work hours you can assign to anyone on the team. This is especially helpful if your software team is spread out across the globe. Use ProjectManager.com to send direct messages to other team members, or, collaborate on a task level to stay focused on the work at hand. 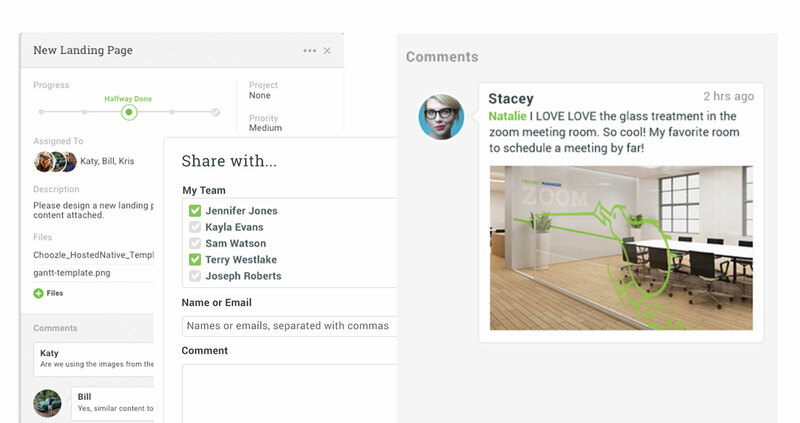 Leave comments on specific tasks and receive email alerts when tasks are updated. Plus, upload and share files with anyone on the team when you use our unlimited online storage. Now that you know about SDLC and the required tools, it’s time to get started on your project! 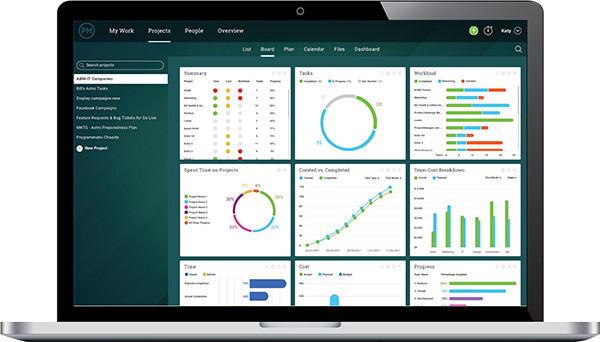 Sign up for a free trial of ProjectManager.com today and see how our online project management software can make your team more prepared, collaborative and productive.